Cricket enthusiasts in India who were disappointed with the shifting of the popular T20 tournament to South Africa now have something to cheer about, as IDEA Cellular is set to launch a unique initiative to connect fans with their cricket super heroes. 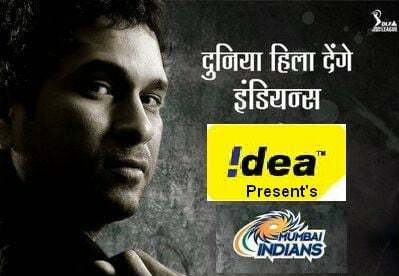 IDEA Cellular unveil an innovative gateway for its customers and other cricket fans to help them connect with Mumbai Indians stars such as Sachin Tendulkar, Harbhajan Singh and Zaheer Khan, through a massive campaign starting tomorrow. For the first time in the history of Indian sports, cricket enthusiasts will get to call and SMS their stars, give them tips and suggestions, wish them Good Luck, and give other messages on phone. The platform has been specially designed with a view to connect fans of IDEA sponsored Mumbai Indians while they play during the upcoming T20 tournament each player of the team will have a unique IDEA number which will be flashed across various mass media platforms, for people to call their favorite stars. This is a first-of-its kind initiative connecting fans with Cricket stars. The communication underscores the power of a mobile telephony idea to unite all Indians behind one team in a way it has never been witnessed before.Mumbai Indians is studded with a number of players of national and international fame who have a huge fan following across the world. Through this campaign, our aim is to bridge the gap between cricket stars and their fans in a way that is personalized, and exhilarating. During the tournament, IDEA will launch a range of value added services for its customers, and will bring cricket updates of Mumbai Indians’ on-and off-field performance. IDEA will also offer a range of value added services such as wall papers, screen savers, ring tones, gaming, match videos, photos, and updates. IDEA customers also stand a chance to win free tickets to the most sought after T-20 matches of Mumbai Indians in South Africa. IDEA will also offer a chance for its customers to win merchandize and meet the players in South Africa. IDEA’s new campaign with Mumbai Indians will break in the media, starting tomorrow. Millions of people across the world will witness IDEA sponsored Mumbai Indians battle with Chennai Super Kings in the inaugural day match in Cape Town on 18th April 2009.